Dishing it up! : It is "Cupcake Friday"!!!! Welcome to the second “Cupcake Friday”! I am having so much fun with this book (and so are my cupcake testers!). It is so difficult to choose which cupcake I’m going to make because I want to make them all. Every single one looks absolutely delicious. And I’m really getting into this cupcake thing. First of all I’m already a fool for these little gems. Then add to that all the different cupcakes in Martha’s book and the other cupcake books that are out. Cupcakes are truly a hot trend right now. So I found a website that I can order all these cool sprinkles and cupcake liners and I made a wish list about a mile long. But I’m realizing that using really cute liners is disheartening because they aren’t showing up after the cupcake is baked. Last week it was my princess liners and this week it is my heart liners. So I’m not sure about investing in more cute liners. But the sprinkles……. This week I chose to make Martha’s Mocha Cupcakes. If you are a java lover, baby these are gonna rock your coffee mug! The recipe calls for espresso in both the cake and the icing. We’re talking coffee here folks! Oh the aroma as these were baking was just heaven. The icing is administered in dollops! What fun. This results in crazy peaks. I was having a blast playing Jackson Pollock. It’s dramatic and artsy and just incredibly cool. Okay, here is where I have to fess up. The recipe calls for Martha’s Seven-Minute Frosting. The thing here is that it is just the two of us in this house. So when I made these cupcakes I didn’t want to frost all of them with a frosting that needed to be used immediately. And I didn’t know how it would hold up. What we do is frost the cupcakes as we eat them. That way the cupcake doesn’t get all soggy and gooey and yucky (technical terms). For this reason I opted to go with the Fluffy White Icing. However, I did flavor it with Kahlua. Now we’re talkin’! I’m giving you the recipe and frosting as written in Martha’s book. These really are quite simple and quick to make. Hint: For the ¾ cup freshly brewed espresso and 1 tablespoon instant espresso powder, I used ¾ cup double espresso from our local coffee shop. Thank you Bob for that idea! Oh, and definitely don’t skip the coffee bean garnish. It really adds that coffee blast! 1. Preheat oven to 325°F. Line standard muffin tins with paper liners. Whisk together cake flour and cocoa. With an electric mixer on medium-high speed, cream butter until smooth and light. Add the brown sugar and eggs; beat until fluffy, scraping down sides of bowl as needed. Add the vanilla, baking soda, and salt; beat to combine thoroughly. 2. Reduce speed to low. Add flour mixture in three batches, alternating with two additions of sour cream, and beating until just combined after each. Mix together brewed espresso and espresso powder; add to batter, and beat until smooth. 3. Divide batter evenly among lined cups, filling each three-quarters full. Bake, rotating tins halfway through, until a cake tester comes out with only a few moist crumbs attached, about 22 minutes. Transfer tins to wire racks to cool completely before removing cupcakes. Cupcakes can be stored up to 3 days at room temperature, or frozen up to 2 months, in airtight containers. 4. To finish, use a small spoon to dollop cupcakes generously with frosting and make decorative peaks. 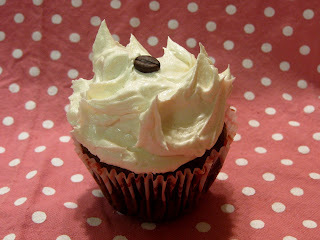 Garnish each cupcake with a coffee bean before serving. 1. Combine 1 ½ cups sugar with the water and corn syrup in a small saucepan; clip a candy thermometer to side of pan. Bring to a boil over medium heat, stirring occasionally, until sugar dissolves. Continue boiling, without stirring, until syrup reaches 230°F. 2. Meanwhile, in the bowl of a standing electric mixer fitted with the whisk attachment, whisk egg whites on medium-high speed until soft peaks form. With mixer running, add remaining 2 tablespoons sugar, beating to combine. 3. As soon as sugar syrup reaches 230°F, remove from heat. With mixer on medium-low speed, pour syrup down side of bowl in a slow, steady stream. Raise speed to medium-high; whisk until mixture is completely cool (test by touching to bottom of the bowl) and stiff (but not dry) peaks form, about 7 minutes. Use immediately. Coffee Variation: Add 2 tablespoons pure coffee extract at the end of step 3, whisking to combine. NOW GO MAKE THESE!!! THEY’RE AWESOME!!! They are so pretty! I'm not a coffee drinker, so I don't think these would be my favorite, but they do look good! And about the liners - I have found that the only time they really show up is when you have a white cake or yellow cake - otherwise, the color of the cupcakes makes the liner hard to see. Hope this helps! Such a cute cupcake! Just saw Martha's Cupcake book at the bookstore - I *almost* bought it but (ahem) I'm supposed to be on a diet.